"Adrienne Albert's music, which I've thoroughly enjoyed listening to, has three A's going for it: It is attractive, accessible, and atmospheric." Music is the universal language that knows no boundaries or barriers. It transports this contemporary American composer to distant lands as well as to places within the vast American landscape. 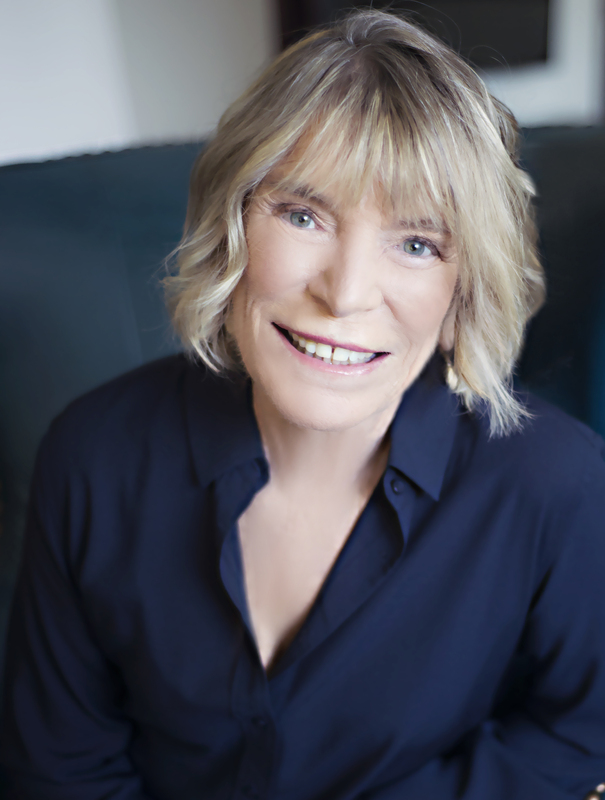 Award winning composer, Adrienne Albert's music has become widely known for its "melodic and lyrical beauty" as well as its "whimsy and playfulness". Come in and learn more about this unique American woman composer and her music. "[Her] music is as fresh as morning." "...fine sense of lyric emotion and fun,"
'Doppler Effect'...lovely, lyrical... performed beautifully"
"This lovely work is alternately meditative and urgent, pastoral and urban. Doppler Effect was inspired by the experience of sitting in cafes in Rome, watching and hearing the pace, melody and cacophony of Roman traffic. The piece did indeed reflect the humor, sensuality and wisdom of the Eternal City." My "Across the C's" for Flute Ensemble (picc, 2fl,alto,bass fl) is a Winner in the 2018 NFA Newly Published Music Competition. Falls House Press. Ovidiu Marinescu, cellist, and Anna Kislitsyna, pianist, of Trio Casals have just released their latest album for Navona Records on which NIGHTFALL for cello and piano is beautifully performed along with other works for piano trio and cello and piano. 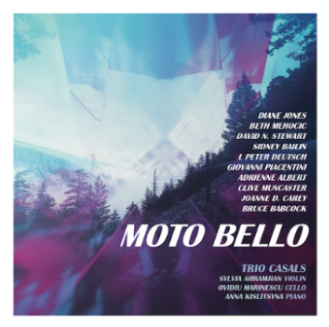 Trio Casals will give a live performance of this and other works at Carnegie Hall's Weill Hall on May 19th. I'm excited to announce that my "SUNSWEPT" for flute and piano has been chosen to be the required work for adult amateurs to perform for the Flute Society of Washington 2019 Competitions to be held at the Mid-Atlantic Flute Convention in February, 2019. Order your copy here. Copies may also be ordered through FluteWorld and Theodore Front Musical Literature. A Great way to start off the New Year! I'm excited that my "WAR STORIES", three movements for flute/piccolo, horn, and piano has been recorded by Michael Thornton, Principal Horn with the Colorado Symphony and the Los Angeles Chamber Orchestra, Julie Thornton, a member of the Colorado Symphony Orchestra and on the faculty at the Lamont School of Music, and Susan Grace, piano. 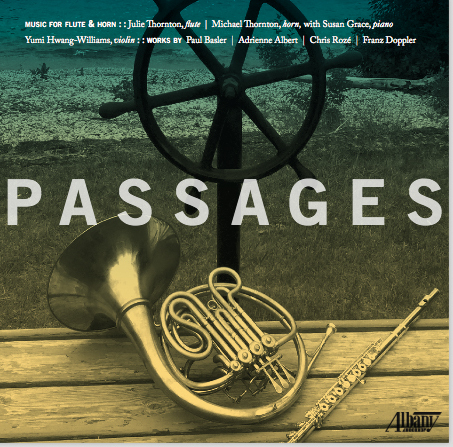 Their CD, Passages was released today! on Albany Records. Be sure to get your copy! I'm honored to be on the same program as Ali Ryerson and Peter Senchuk, two wonderful musicians and composers. 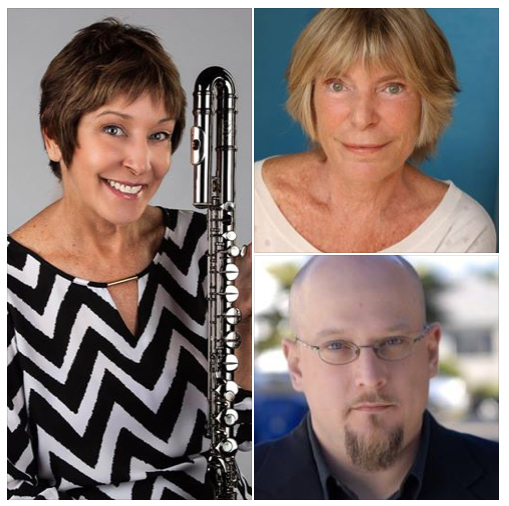 The Los Angeles Flute Orchestra will be performing my "ACROSS THE C's" for flute quintet (piccolo, 2 C flutes, alto, and bass flutes} at the charming Miles Playhouse in Santa Monica, Friday, January 19th, at 8 pm. Reserve your seats ahead. These performances sell out quickly! A new version of "Wind Tides", "Wind Song" for Horn in F and piano , was just performed by the Principal Horn of the Colorado Symphony and of the Los Angeles Chamber Orchestra (LACO), Michael Thornton and Margaret McDonald, pianist, at the University of Colorado-Boulder in Grusin Hall in October, 2017. Mike Nelson of University of Montana at Bozeman performed it on February 7th, 2018. 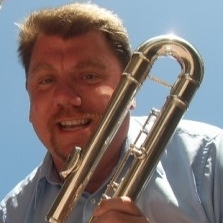 "Wind Tides" for trombone and piano , commissioned by Andy Malloy, and the first cut on his double CD, Paper Clips, was the 1st Prize Winner of the Wright State University Trombone competition in 2016. Megumi Kanda, Principal Trombone of the Milwaukee Symphony Orchestra performed it at Wright State University Trombone and Horn conference in Dayton, OH. Megumi performed "Wind Tides" again at the Trombone Conference in Redlands, CA in June 2017. "Reflections" has been recorded by the wonderful clarinetist, Sunny Kang, on her beautiful CD, "Solace" and released on Summit Records. Rebecca Jeffreys, flutist, has released her first CD titled "Poems and Dreams" on which my "Acadian Dreams" (commissioned by Rebecca) for flute and piano is one of many wonderful works for flute and piano. "War Stories"trio in three movements for flute/piccolo, horn, and piano was recorded by Michael Thornton, principal horn of the Colorado Symphony, and Julie Thornton, flutist in the Colorado Symphony. The recording will be released in late 2017-2018. The piece, commissioned by the Zinkali Trio, finally had its premiere performance at the New Jersey Flute Society in Montclair, NJ. It was a rousing success! The entire work is available on this website! The Cornell University Chorus, under the direction of Robert Isaacs, commissioned me to compose a work for their fall 2015 concert. Titled MALALA, the piece is based on the name and sayings of the extraordinary young Pakistani woman who recently won the Nobel Peace Prize. Scored for SSAA a cappella, the Premiere took place at Cornell in the fall of 2015 and then the Chorus toured Guatemala and Mexico in January of 2016 performing Malala in various towns across Mesoamerica! Two new works for flute quintets (one high and one low) were premiered in August, 2015 at the National Flute Association convention in Washington, D. C. Peter Sheridan commissioned "Visions of Grace" for Low Flutes and the Norwegian group, 5 Across, commissioned "Across the Cs". Check out the score pages for more info. It was an honour to be an invited guest to the 9th annual FESTIVOKAL in Bad Nauheim, Germany just outside of Frankfurt. I attended at the invitation of the Festival Director, Thomas Bailly, in May, 2015! The choirs were outstanding, the people delightful, and it was a memorable event that I hope to enjoy again another year! Another Wonderful review of the fabulous FIRE PINK TRIO's performance of my Doppler Effect for flute, viola and harp. From their Raleigh, NC concert on March 15, 2015. Click on the link to read the review! Their 1st CD is out NOW and I'm thrilled to say that Doppler Effect starts off this wonderful CD titled "Poetry in Motion". MSR Classics! Yet Another Wonderful review of FIRE PINK TRIO's performance of my Doppler Effect for flute, viola and harp. "This lovely work is alternately meditative and urgent, pastoral and urban. Doppler Effect was inspired by the experience of sitting in cafes in Rome, watching and hearing the pace, melody and cacophony of Roman traffic. The piece did indeed reflect the humor, sensuality and wisdom of the Eternal City." Click the link to read the whole review! Based on an adaptation by Susan Suntree of The United Nations Declaration of Human Rights, Adrienne has set this imposing work to music for choirs and piano that has been given numerous performances. Most recently, The American Jewish University in Los Angeles, CA gave it a beautiful and emotional performance as the headliner to their Human Rights Week.. To read more about this work, please visit the commissions page. Another New Work! 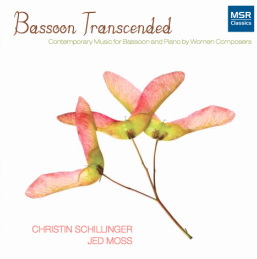 Swing Shift for bassoon and piano, is now available through my website and was premiered at the International Double Reed Society in Redlands, CA on June27th, 2013 by Christin Schillinger and pianist, Jed Moss! Swing Shift is also available through TrevCo-Varner Music! Adrienne Albert was awarded a Subito grant from the American Composers Forum San Francisco Chapter to help complete her new CD, Musescapes, that will be released later this year! Thank you, American Composers Forum sf! Two new commissions: for Chamber Music Palisades, Cuban Adventures, for flute, viola, bass clarinet and piano premiered on May 6rd, 2014 and a new work for piano trio, A Golden Celebration, commissioned by Sandra Wiese in honor of the 50th Anniversary of the Mu Phi Epsilon Fraternity Foundation premiered on July 30, 2014. Thrilled that my new work for piano trio, A Golden Celebration, commissioned in honor of the 50th Anniversary of the Mu Phi Epsilon Foundation, was given a Brilliant premiere at the MPE Convention in Sacramento, CA on July 30,2014 by three former winners of the MPE competitions. The music will be available soon. Stay tuned! Looking forward to greeting old friends and meeting new ones at the Chamber Music America conference at the Westin Hotel, NYC, from January 16-19, 2014. I'm happy to report that I was chosen as a FINALIST for The American Prize for 2013 in the orchestra division for my Western Suite. Visit the link to find out more about "Western Suite". My New CD! 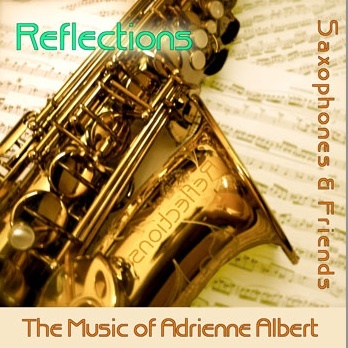 REFLECTIONS: Saxophones & Friends, the Music of Adrienne Albert. is Out Now! Check out CD Baby, Amazon or purchase here on my website! PAPER CLIPS! New double CD out by the marvelous Los Angeles trombonist, Andy Malloy: Works for Trombone and piano is now out on Navona Records! Andy commissioned my work, "Wind Tides" for trombone and piano which begins the CD set . Now available at Amazon, iTunes and your local record dealers. One of the featured performers on Andy's album is pianist, Karolina Rojahn, and PARMA will have a digital-only release called The PARMA Sessions: Karolina Rojahn and will feature many of the pieces from the album including my WIND TIDES. More Bassoon! BassooNova for solo bassoon, commissioned and premiered by Andrew Moore at Miami University in Oxford, OH will be available soon through my Website! Check it out! Adrienne has been invited to be a Guest Speaker at the Mu Phi Epsilon District Conference at Cal State University Dominguez Hills on Saturday, November 10th. I am excited to have several of my works performed and to speak about my life as a teacher/singer/business owner and composer! slogan “Fine Music.” You can purchase the CD, "Light and Shadow" here. Based on "The United Nations Declaration of Human Rights" adapted by Susan Suntree , Adrienne Albert has set this imposing work to music for choir and organ that was performed by a choir of 100 voices on 9/10/2011 on the steps of Los Angeles City Hall in remembrance of the 10th anniversary of 9/11. Philip Smith, organist and Conservator of the Disney Hall organ will conduct this choir in a memorable event with members of Interfaith choirs and the Los Angeles City Council participating. To contribute to this worthy cause, please visit the International Humanities Center page. For more information about the One Light event, please click that link. 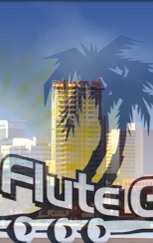 "Three for Two " was performed on the Los Angeles Flute Orchestra concert in Santa Monica, Friday, April 13th! at 8 PM with Peter Sheridan, Low Flutes Expert! "L.A. Tango Nuevo " was broadcast on KPFK fm, 90.7, Thursday, March 15 at 11:05am on John Schneider's Show. and performed on the GUITARATHON in Culver City and Pasadena, CA on March 24 and 25! A New Release! 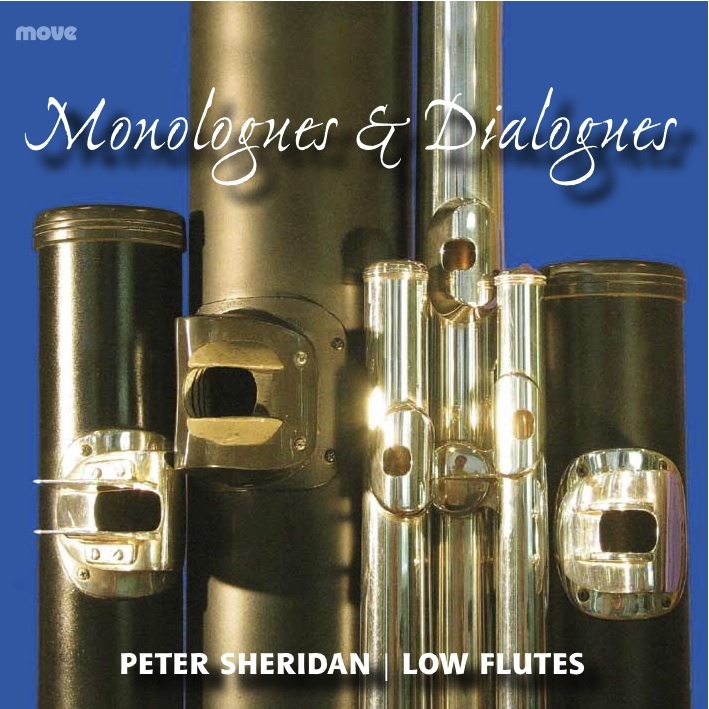 Peter Sheridan, the fabulous Low Flutes Specialist has just released his newest CD, Monologues & Dialogues on MOVE . I'm thrilled! My commissioned work for Peter for alto/bass flutes and contrabass flute, Three for Two, is featured on this wonderful new album. Check it out! A First! My very first published Review: the LA Opera production of the Benjamin Britten opera, The Turn of the Screw now online at: CultureVulture.com. I'm thrilled! Click the link to read! Adrienne Albert and her music are now featured on Classical Matters. The US Air Force Mid-West Winds performed my woodwind quintet, Animalogy in two concerts in Illinois! Doppler Effect now out on CD #4 ! My popular trio for a variety of instruments, Doppler Effect, has been released now on 4 CDs! 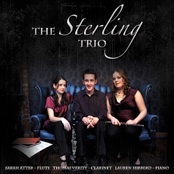 Brand new, hot off the presses is the newest CD just released by The Sterling Trio for flute, clarinet and piano, another by The Trelumina Trio for flute, bassoon and piano. Other CDs currently available with Doppler Effect include Lily's Eyes, a beautiful version for flute, cello and harp by Carisma, and the first of 4, a wonderful version for C flute, Alto flute and piano by Duo Viva aptly titled Doppler Effect! 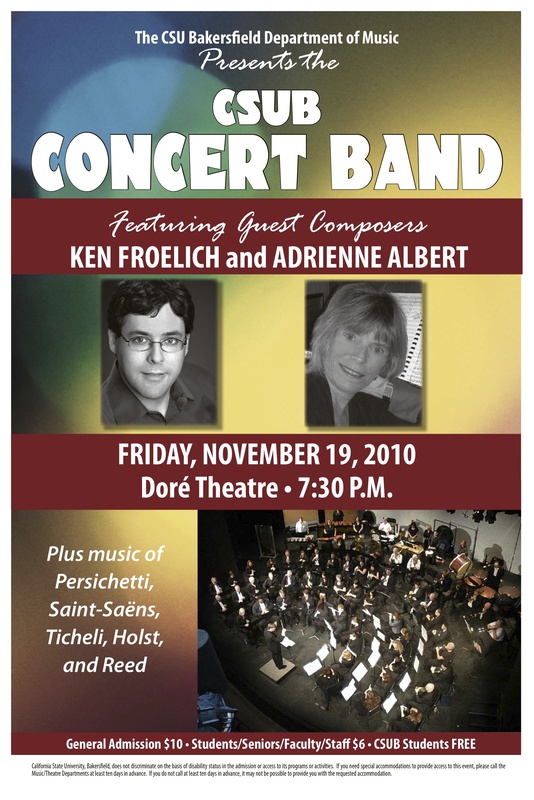 Adrienne was Composer-In-Residence at Cal State University, Fresno, October 15-17, 2009 for their New Music Festival. Her newest works, Theme and Inventions,for oboe, clarinet and bassoon was premiered by the Definiens Project. Her new Saxophone Quartet, Eastern Hymn was premiered by the Cal State University Fresno Saxophone Quartet.. And Courage for Orchestra was performed during this residency with Thomas Lowenheim, conducting the Fresno University Orchestra. Don Freund, of Indiana University was alsoIn-Residence during this Festival! Great company! I'm pleased to announce that TrevCo Music, noted publisher for double reed music, is now carrying my Double Reed Music. A Link to TrevCo Music can be found on my Contact page. Adriennehad a great time meeting and getting to know a lot of wonderful folks at theChamber Music America Conference in NYCat theWestin Hotel January 16-17. The ever creative Free Spirits Ensemble in Raleigh, NC performed Adrienne Albert's Spring Ahead from Circadia with Dancers on March 20th! Courage for Winds was performed in four concerts in Long Beach, CA by the marvelous Long Beach Municipal Band. July 20, 21, 22, and 23, 2010. It was a big celebration and rousing success! Check the Concerts page for more info. 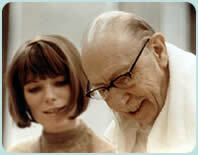 Ken and Sandy Hedgecock's Interview with Adrienne Albert is now Podcast and can now be downloaded on Classical Music Discoveries. Adrienne and her music were featured at the Diego Flute Festival Sunday, Apr 25th. Peter Sheridan premiered her "Three for Two" for low flutes with Marion Frederickson on contrabass flute. Adrienne was at La Sierra University in Riverside, CA as Visiting Composer and lecturer on March 7th. "Eastern Hymn" for saxophone quartet has been chosen to be performed at the University of Central Missouri during their April Music Festival! 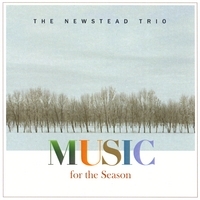 The Newstead Trio's beautiful, evocative CD, Music for the Season, was submitted to be considered for a Grammy nomination in the Classical Crossover category. Included on the CD is Adrienne Albert's original seasonal song, Upside Down Wish List and two arrangements: Angels We Have Heard On High and Deck The Halls that are up for Grammy nomination consideration in the Composer/Arranger category. Please click the titles to listen to these beautiful recordings! "[Susan] Greenberg, [Carolyn] Beck were joined by harpist, Maria Casale for a fantastic piece by Adrienne Albert, 'Doppler Effect'...lovely, lyrical... performed beautifully by the performers." Adrienne Albert was awarded Honorable Mentionin the2009 Areon Flutes Competition. 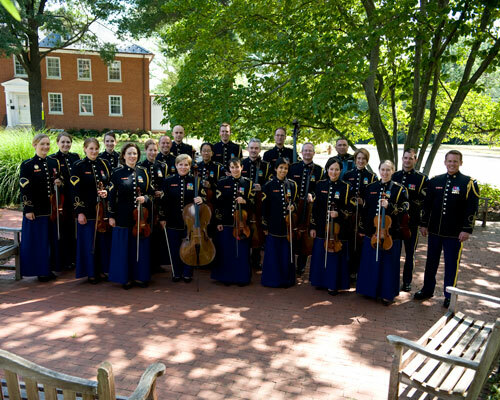 from the Los Angeles Alumni Chapter of MPE in support of her recording two string orchestra works with the Moravian Symphony Orchestra in Prague, Czech Republic in November, 2009. Adrienne was guest lecturer at La Sierra University in Riverside, CA on the topic, "Culture in Perspective". Date: May 1st, 2010 in the class of Dr. David Brennan. Animalogywas a Hit with the Spring Winds in Hawaii. Please read the Review page. Adrienne Albert's Songs were featured at CSUFullerton for Mu Phi Epsilon Conference! The wonderful soprano, Linda Jackson, and the fabulous pianist, Delores Stevens, performed several of my songs along with a Puccini aria at the Pacific Southwest Province District Conference of Mu Phi Epsilon on Halloween Day! Come one, come all! Adrienne was a Featured Composer, had her music performed and talked about her life in music at the 29th L.A. Composer Salon on Sunday, July 27th in Venice, CA. A great time was had by all! Another win for Animalogy!. The Avenue Winds, a delightful San Francisco based woodwind quintet, chose Adrienne's woodwind quintet, Animalogy, to perform at the NACUSAsf concert on June 6th in Portola Valley, CA. Animalogy was a Winner of the Aeros Quintet Competition and was performed at Carnegie Hall's Zankel Hall in May of 2008. The third movement of Musescapes, Ode to Piazzolla has been chosen to be performed on the NACUSAsf program in November! More information will follow. Premiere: Musescapes Adrienne Albert's new piano trio work, Musescapes, co-commissioned by Carol S. Gee and The Newstead Trio, was premiered on April 03, 2009. Adrienne gave seminars and spoke to the Inner City Schools of Lancaster, PA on April 3rd, 2009. Courage for Winds was commissioned by a consortium of symphonic wind bands through the Inland Empire Wind Band Ensembles under the direction of Jeffrey Boeckman. The premiere was held on May 17th, 2009 in the Inland Empire (otherwise known as San Bernardino, CA). Future "premieres" by the Consortium will occur over the next several months. The Definiens Project will be the featured artists who will perform a new work by Adrienne written especially for them for the New Music Festival at Cal State University, Fresno in October. More info to come! The Newstead Trio has just released a Holiday CD with arrangements by Adrienne Albert. Titled Music for the Season, this CD is available here. as well as on CD Baby and Amazon.com. A Must for this Holiday Season. See CDs listed below. Animalogy was a Winner of the Aeros Quintet Competition and was performed on their debut concert at Carnegie Hall's Zankel Hall on Monday, May 5th, 2008. Animalogy was chosen a Winner of this auspicious competition from over 150 entries submitted from around the globe. See the Concerts page for additional information. CT Tango Nuevo for alto flute and guitar was chosen to represent the US in the Concerto con Musiche dalle Tres Americas in Rome, Italy on Nov 12, 2008 for the 30th celebration of Fondazione Adkins Chiti: Donne In Musica. Images and Lullaby for Piano Trio were selected to be performed on the 75th Anniversary Concert of NACUSA in Los Angeles with the noted cellist, Ruslan Biryukov, pianist Mary Au, and Limor Toren-Immerman performing October 12th and19th, 2008 in conjunction with Daniel Pearl World Music Days. Adrienne was interviewed by Martin Perlich on his wonderful show on KCSN-FM (88.5 FM) on Wednesday, April 23, 2008. 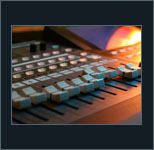 His show, Art & Roots Forum (ARF) can be heard daily by clicking here. Adrienne attended the Chamber Music America Conference in NYC at the Westin Hotel from January 3rd to January 7th. She held forth at her own booth and greeted many wonderful people through her publishing company, Kenter Canyon Music. Saxophonist Alan Durst and Guitarist Corey Whitehead have released their first album on Centaur (CRC 2901) titled Tangos y Serenatas. Featured on this wonderful new CD is L.A. Tango Nuevo along with works by Piazzolla, Boone, Carlson, Paraskevas, Bard, and Froelich. CDs are now available through Amazon.com and record stores near you! The front page article of the Sounding Board this month is an article written by Adrienne about her experiences in Alaska while composing her "An Alaskan Symphony" through a generous grant from the NEA in conjunction with the American Composers Forum for the Continental Harmony project in Alaska. Read all about it!! Adrienne received the prestigious ACME Award, the organization of Artists, Composers, Musicologists and Educators under the umbrella of Mu Phi Epsilon Music Fraternity. She has also been featured in numerous articles in the Homer Tribune, Homer News, and Anchorage Daily News about her recent Continental Harmony premiere in Alaska. "Just wanted to personally thank you for the music you composed for our community. It touched many, many people. How you were able to capture the feel of us without actually living here for years was simply amazing. It completely moved me to tears. I spoke with you after our rehearsal in Kenai and was just sobbing...it was so wonderful to actually be a part of your music. I myself met a personal triumph this past weekend. I was able to attain that goal through your music. You will never quite know how your music has left a track of prints across my heart and a stirring in my soul for more! Thank you! Thank you! Thank you! Adrienne was awarded an Artist-in-Residence Fellowship to the Ucross Foundation in Wyoming for the fall of 2007. From this extraordinary experience came her new work, commissioned by Chamber Music Palisades, Americana (2008) for flute and string trio. LIFESTYLE: "Composer Adrienne Albert will premiere her new chamber work with the Pacific Serenades Chamber Ensemble on Tuesday, April 24, 8 p.m., at The UCLA Faculty Center. A long celebrated vocalist known par...", view article. 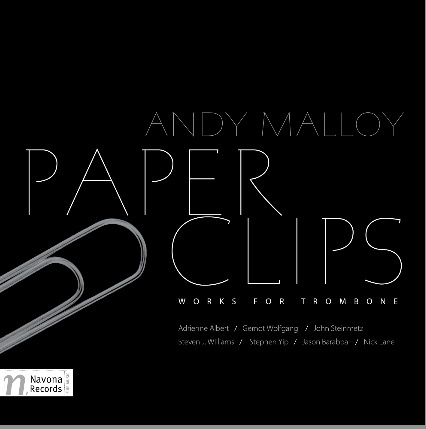 "Paper Clips "New double CD out by the marvelous Los Angeles trombonist, Andy Malloy : Works for Trombone and piano is out now on Navona Records! Andy commissioned my work, "Wind Tides" for trombone and piano. Available at Amazon, iTunes and your local dealers. 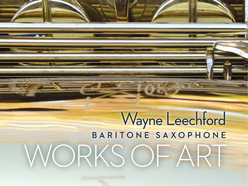 A compilation of my saxophone works plus works for bassoon and other friends! Included on this Fabulous new album are my commissioned works for Peter, "Three for Two" for albo/bass and contrabass flutes. On MOVE. 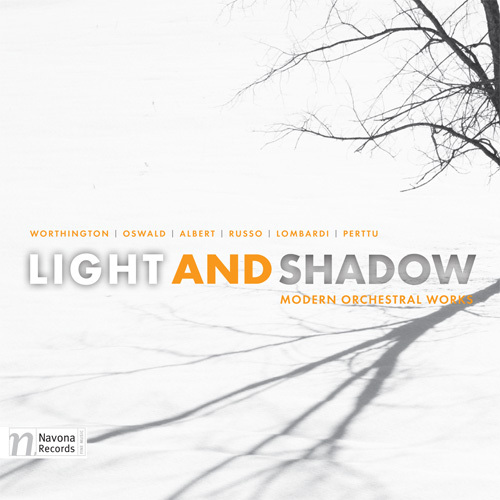 LIGHT AND SHADOW is an all-new collection of modern orchestral works from composers Adrienne Albert, Daniel Perttu, Rain Worthington, Rebecca Oswald, Russ Lombardi and Tadd Russo just released on Navona Records. The Newstead Trio has just released a beautiful album of Christmas favorites with arrangements of Deck The Halls, Do you Hear What I Hear, The Cherry Tree Carol and more by Adrienne Albert. Included on this CD are a number of my more recent chamber works for your listening pleasure! Saxophonist Alan Durst and Guitarist Corey Whitehead released their first album on Centaur (CRC 2901) titled Tangos y Serenatas. Featured on this wonderful new CD is L.A Tango Nuevo along with works by Piazzolla, Boone, Carlson, Paraskevas, Bard, and Froelich. Now available through Amazon and your favorite stores. Included on this CD is Doppler Effect for flute, harp and cello which combine gentle, soothing music celebrating the wonder of the world as seen through the eyes of a child. The fabulous saxophonist, Doug Masek, released the first of a three CD set for Centaur Records. Included on "Saxophone Alternative" is Adrienne Albert's "Winter Solace". Duo Viva has just released their first CD aptly titled Doppler Effect. Alice Lenaghan, alto flute, Mihoko Watanabe, flute and Robert Conway, piano, play my Doppler Effect. Duo Viva comissioned this version for this CD. Please visit Little Piper for more information.. Distant Memories, by the wonderful saxophonist, Doug Masek, includes my Reflections for soprano saxophone and piano. A lyrical work, Reflections has been performed by Doug in many places around the globe. Adrienne's Western Suite is released on an ABC Classics CD with The Tasmanian Symphony Orchestra performing and Sean O’Boyle conducting. This lovely CD also includes works by Bloomer Deussen, Carson Coonan, Jennifer Higdon and Robert Wendel..
Another version of Doppler Effect can be heard by the lovely Trelumina Trio performing works by Gaubert, Bizet and yours truly!